Hugo Boxer TC160 Review - Daily Vaping Deals & The Best Vape Product Reviews at Vaping Cheap! Special thanks to my friend Doris over at focalecig.com who provided the review sample of the Hugo Boxer TC160. At the time of this writing it is available here. Buy Hugo Boxer TC160 Now! The Hugo Boxer TC160 comes in a standard 2 piece “Gift Box” package. 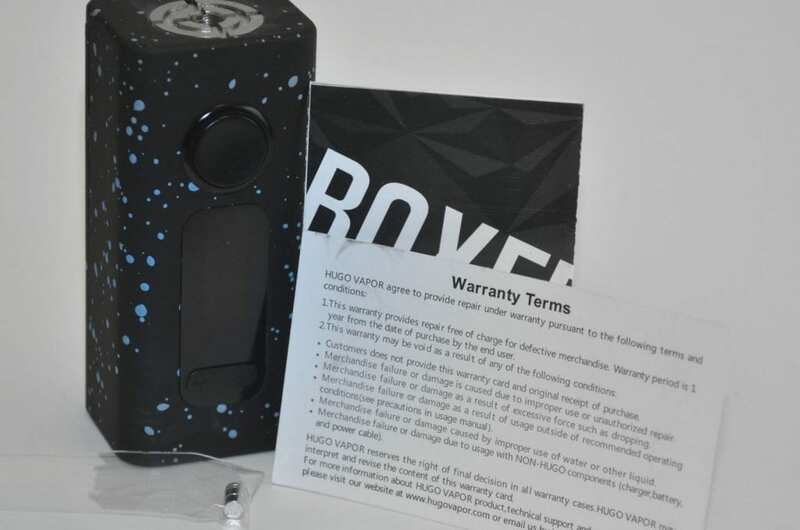 When you open the box you will see the mod nestled in the protective foam, an instruction sheet, and a small plastic bag, which on closer inspection turns out to be spare magnets for the mod. There is also a space for a USB charging cable, but this is only because the packaging is the same as the Hugo Boxer 80. This mod has no USB port though, so a USB cable isn’t included. Opening up this package, I found the black and blue Hugo Boxer TC160. My first thought was about how big it looked in the box. Needless to say, removing it from the box only confirmed that this mod is really big, and square. It is fairly heavy, even before you put two batteries in it. I would guess it is roughly thirty five percent bigger than the Cuboid. I could measure them both, if only someone hadn’t stolen my Cuboid. Despite it’s size, the black rubberized finish makes it feel a little better in the hand than I expected. 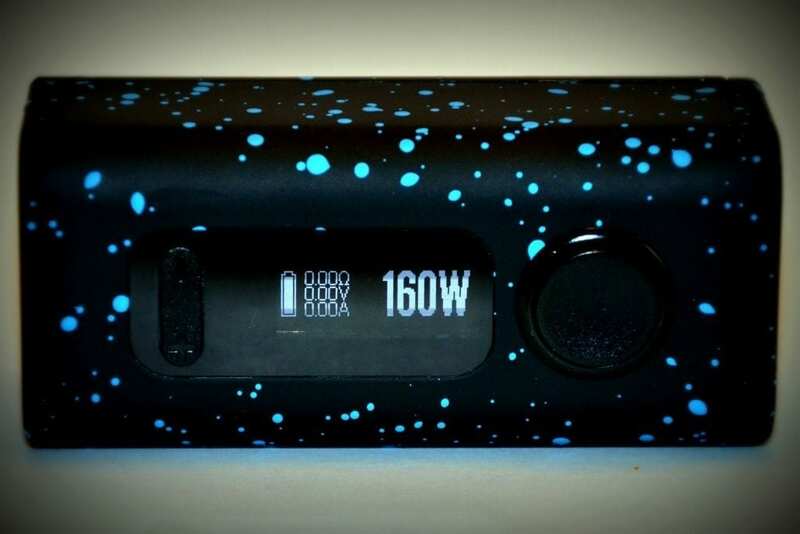 The blue “speckles” in the finish are more of a 3D texture than just colored spots, and make the mod a little easier to keep a good grip on it. The sliding battery door is held on by 4 tiny magnets, two at the top, and two at the bottom. The magnets aren’t very strong, but they seem to do the trick, at least for the most part. The door itself sits on the frame somewhat loosely, there is a little slippage and side to side play in it, indicative that the manufacturing tolerances are a little sloppy. The battery tray is marked for each battery, it’s a pretty traditional style where one battery goes in with the positive pin at the top, and the other “upside down”. The 510 connector is your standard spring loaded, stainless steel variety, with some airflow channels. The buttons are plastic, and don’t rattle. The screen is pretty good sized, large enough for a useful 3 line display. With the exception of the battery door, everything seems to be put together pretty solidly. Note: Per the manufacturer, 25A high-drain batteries are recommended for use with the Boxer TC160. The Hugo Boxer TC160 has one of the coolest finishes that I have seen to date, and it seems to be very durable. The black base color is a rubberized, soft grip finish, with a secondary “speckled” teal blue overlaid on top of it. On the left side of the mod is the word “Boxer” in large deep letters. 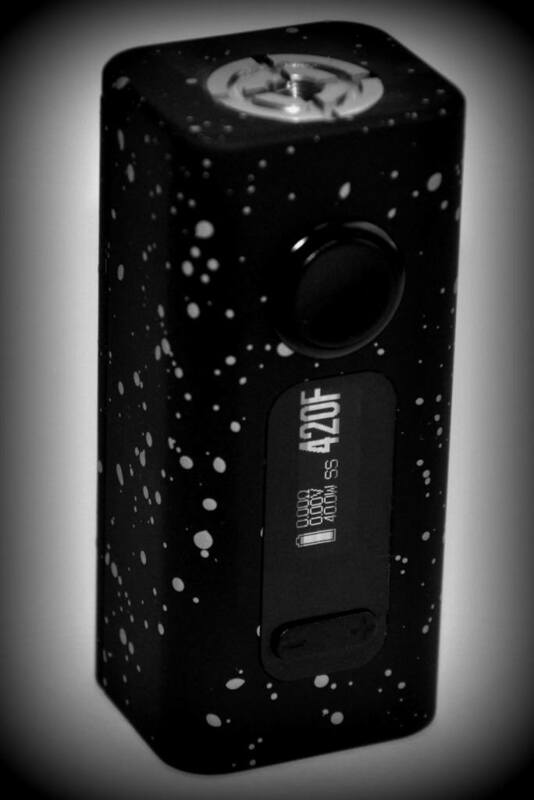 What makes the finish really stand out is that the speckles add a three dimensional texture to the mod that really make it easy to maintain your grip on it. Given the size of the mod, this is very helpful. I am very hard on my mods, so I don’t do a “scratch test” on mods for my reviews, if they are going to scratch easily it will usually occur over the two weeks I spend using the mod. The Boxer TC160 has held up to all the abuse I’ve put it through without a single scratch. I would anticipate that carrying this mod in a pocket will eventually cause the finish to wear through, much like every other rubberized mods out there. I did not deconstruct the Boxer TC160 to confirm, but the available information from the specifications clearly state that the Boxer TC160 chassis is a combination of stainless steel and zinc alloy. This combination gives it strength and a bit of a heft, which makes it feel quite solid to hold. The stainless steel, spring loaded 510 connector has a brass center pin, but is oddly placed on top of the mod. While the mod is quite large, placement of the connector towards the front of the mod limits you to about a 25mm atomizer if you don’t want any overhang. Near the top, on the front face of the Boxer, is the large plastic fire button. The buttons are clicky and provide good positive feedback when you push them. Directly below the fire button is a good sized OLED display. Immediately below the display, but still in the plastic display face, is the up and down adjustment button bar. This bar, on my review mod, is not well seated and the down side appears to be permanently depressed while the up side seems to be correctly placed. On the bottom of the mod are 24 holes for ventilation, and another 40 of them on the battery door. In the event of a catastrophic battery failure, there is plenty of ventilation to hopefully allow the sudden release of gases without any damage to the mod itself. As I mentioned before, the slide on battery door is held in place by 4 magnets that seem to mostly do their job. The magnets are on the weak side however, and would have been a lot better if they were stronger. There have been a couple of occasions where the door has come off by itself in my pocket, and once where it fell off when I set the mod down. 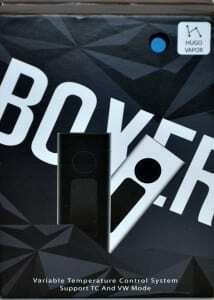 Obviously lacking from the Boxer is a USB port. Basically this means that what you bought is what you get, because without a USB port, there is no hope of firmware updates. This, of course, also means that there is no way to charge this mod on the run, and no pass through capability for vaping while charging. Make sure you have a spare set of batteries so that you can continue to use the mod while one set is charging. 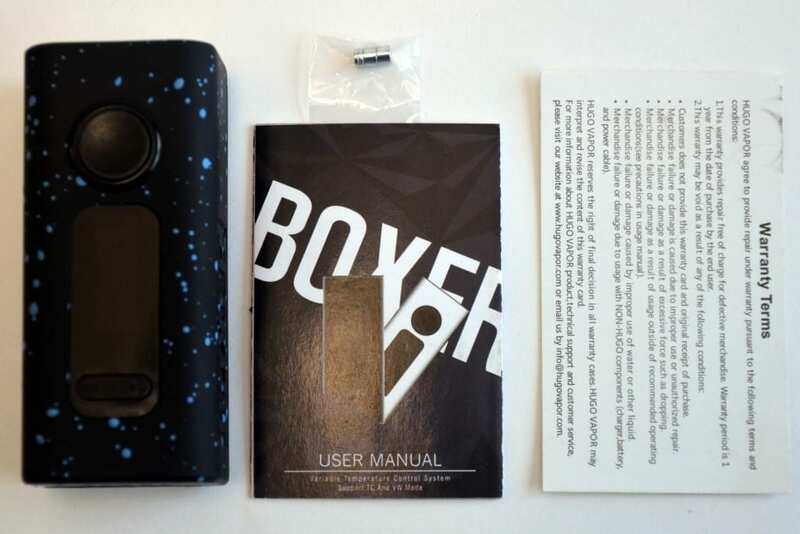 Once you install the dual batteries into the Hugo Boxer TC160, the words “HUGO Vapor” scroll across the screen, followed by the words “Boxer160”. From here, five clicks of the fire button will place the mod into standby mode. Five more clicks will bring it out of standby and back to a ready to use state. 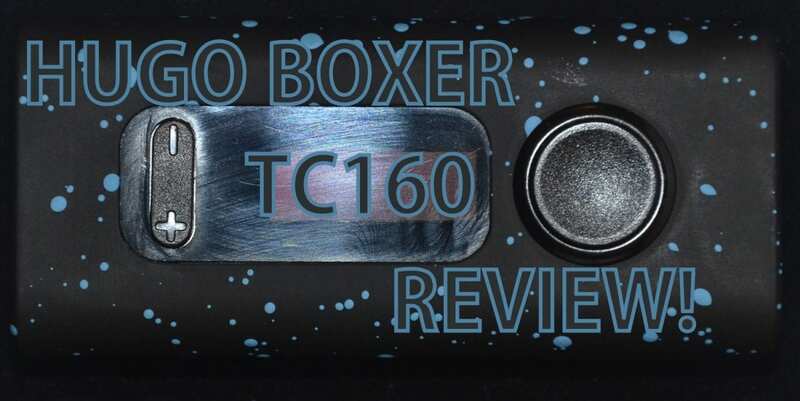 At 160 watts max, this mod is not at the top of the Wattage Wars, where the contenders are pushing the limits of the batteries at 300 watts now, but the Boxer TC160 is no slouch either, and is more than enough power for most vapers. In my testing, it took everything I threw at it with no hesitation with one exception, and I’ll cover that in the Temperature Control portion below. The menu is mostly a simplistic system, three clicks of the fire button and you are in the menu. This is where you can use the up and down button bar to cycle through the various options of Mech mode (otherwise known as Bypass mode), Watt mode, Temp NI mode, Temp TI mode, Temp SS mode, and Atty Lock. Once the mode you want is displayed on screen, simply hit the fire button to select it and start vaping. Atty Lock is used to lock the calculated resistance of your atomizer, although while it does work, I have not found a reason to actually use it in my testing for this review. Additional features are accessed by holding a combination of buttons. Holding both the up and down buttons will lock the power in Watt mode, and lock the temperature in any of the temperature control modes. Holding them down again will unlock it. If you hold the Fire button and the down button, it will turn the screen on and off to put the mod in stealth mode. When you are in any of the temperature control modes, holding down the Fire button and the Up button will put you into manual TCR mode so that you can adjust for custom wires. Given that the Hugo Boxer TC160 is capable of 160 watts max, it’s good to see that they thought through the safety features. This list includes a lot of features to keep you from hurting yourself, although it isn’t stupid proof, as well as a good number to protect the mod as well. I won’t list them all, but most notable are reverse polarity protection, Low resistance protection, overheat prevention, Short circuit protection and low voltage protection. If you are reading the specifications on this mod, then the Hugo Boxer TC160 seems very capable in the temperature control department. Per the specs, it is capable of all three of the most popular coil wires, and includes the ability to manually adjust the TCR for other wires. The reality is that it falls down a bit in the area of performance in these modes. The chip set behaves like a cheap clone board. While it does regulate temperature to keep the wick from burning, it does not do it smoothly or consistently. Instead it suffers from the pulsing style temperature control that is all too common on inexpensive mods. Ultimately though, it does the trick and works as advertised. The chip set in the Hugo Boxer TC160 is a proprietary design. The chip set has a full complement of features. Not all of them work as expected, but they do all seem to work in my testing. The chip seems to be a little off when detecting resistance, but only by about .02 or .03 higher than my other mods. I don’t have any equipment to test output to determine if this proprietary chip set works as expected, so all of my observations here will be very subjective and based on my knowledge and comparison to my other mods. Battery management so far has been exceptional. The dual batteries will run for about two full days in my usage. When placed on my charger, they are within .03 volts of each other, which is indicative that the discharge rate from them is well balanced by the mod. 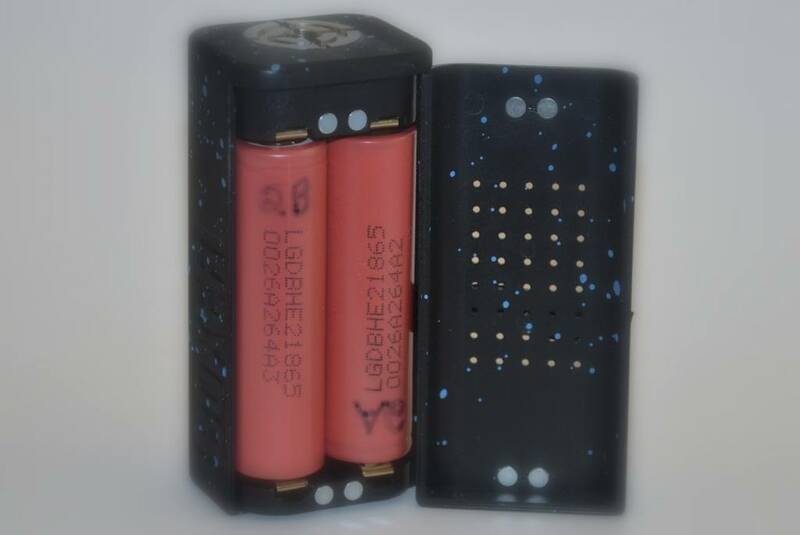 Mech mode: In this mode, the chip seems to do as expected and dump battery power straight to the atomizer. Watt mode: When using wattage mode, the performance of the chip is questionable, but it does act as if it works as expected, at least within a 5% or so margin. Temp NI: In Nickel mode, the Boxer does seem to regulate temperature properly. It is not a consistent vape, it pulses hot and cold to maintain temperature, but it does keep the wicking from burning. Temp TI: I don’t have any titanium coils so I was unable to test this mode. Temp SS: It should be no surprise that performance here is identical to the performance experienced in Temp NI mode. Manual TCR adjustment is a nice feature to have, but it does not seem to match up with actual TCR values found in the calculator on the Steam Engine web site. For example, SS-316L is listed at .096 but in the Hugo chip set, I’ve found that 8 seems to be the best, in fact, it is what they set as default. Default for Nickel in the Hugo Vapor chip set is 68, and Titanium is default at 55, again, neither of these matches with the actual known values for these wire types. The Hugo Boxer TC160 falls about the middle of the road as far as mods go. It offers decent performance for a pretty fair price. The mod seems to be pretty well built, it feels like a quality construction job that should hold up fairly well. With a max output of 160 watts, it should be okay for all but the most serious cloud chaser. Power management is really good and gets almost two full days out of a set of batteries in my usage. The rubberized finish is exceptional, and even with carrying it around in my pocket (sometimes a bit difficult due to it’s size), the finish is holding up beautifully and not showing any signs of wear so far. Ventilation is exceptional, so if something goes wrong, there is plenty of room for the batteries to vent relatively safely. Even though the buttons are plastic, they seem to be well designed to provide good tactile feedback when pressed, even if they aren’t mounted well. It has a very nice display that is visible under most lighting conditions and shows you everything you need to use the mod. Of course not everything is ever rosy across the board. Some of the issues I have with it include the up and down button bar alignment, the shifting battery door and the really weak magnets. For me, this is a huge problem, and really speaks to the quality control of the mod more than anything else. Manufacturing tolerances should be a bit tighter for things that have been problematic and really plagued the industry since the beginning. Another issue is the non standard and undocumented TCR adjustments. Both the process to adjust the TCR as well as the unusual numbering system to set the TCR. I wish I could find a chart to know where things line up with traditional TCR settings. This of course leads to the poorly written and not very useful instruction sheet. Be prepared to screw around with the Boxer until you hit on the magic combination that works for you. Then there is the 510 connector, why would you put this so far forward on a mod this big, that you can only use up to about a 25mm tank or rda without any overhang? This seems like a crazy move. 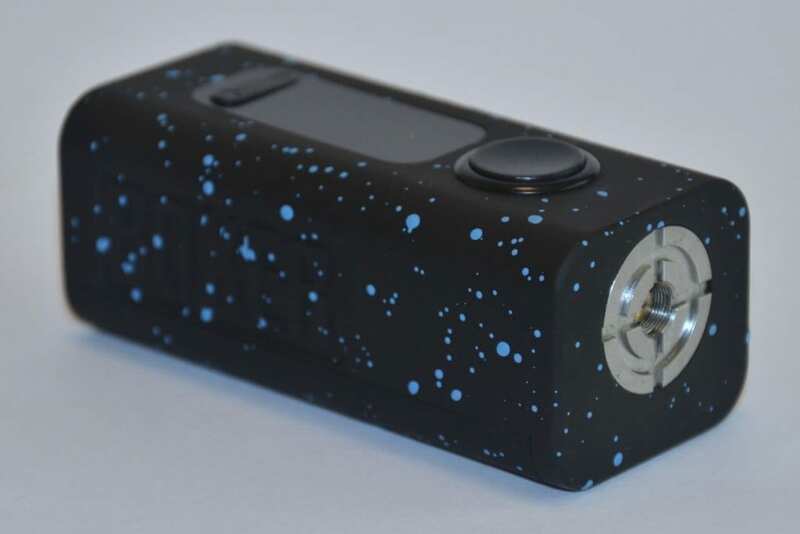 The bottom line is that if the Hugo Boxer TC160 does what you need then it isn’t a bad box mod, especially for the little money you’ll spend to get one.